When it comes to baby/toddler photo milestones, when Henry was born, there there some precious moments I knew I wanted to capture. Taking the baby home (snug), tummy time (too cute), first steps (finally), meeting Father Christmas (the real one) and in this instance, pumpkin picking. 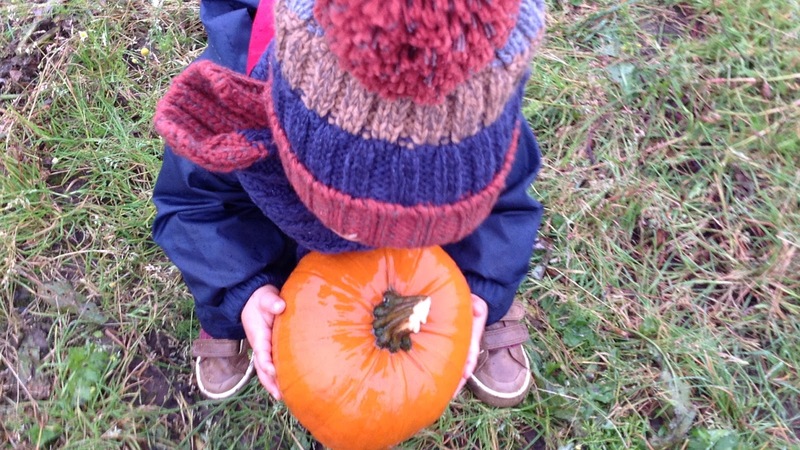 The Farm opens up its Pumpkin fields from the 15th to the 31st October to families and alongside the picking, their is pumpkin carving, face painting, spooky story time, halloween food treats and gifts...Oh my.... There is no booking required and entrance to the fields are free, you just pay for your pumpkins and activities (perfection). So completely terrified all the pumpkins would be picked on opening day (I've been reassured by the farm they won't) I packed Henry up in the car at silly o'clock in the morning to hit the fields. Thankfully I wasn't alone in my pumpkin dash and my beautiful friend Julie and toddler Kasper came along for the fun. Henry's still shaky on his little legs so I wrapped him up in his Puddlesuit to protect his clothes. Which in the end was a godsend as it started to rain upon arrival. It also felt a little cold this morning, so I added a hat and scarf (similar here) and my new favourite purchase, his LittleLife Ladybird Backpack. 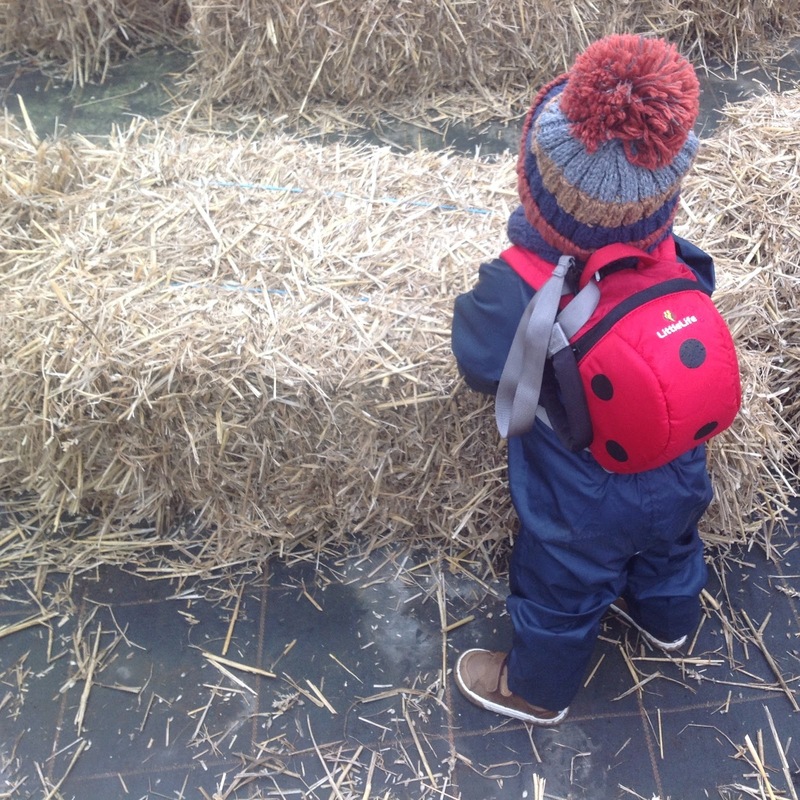 Because Henry isn't 100% on his feet I didn't put him in wellies, however if your little ones are steady, I fully recommend wellington boots (for you too). On arrival at 9.30am we easily parked within the farm, however on leaving around 11.30am it was building up quick, so I recommend either an early start or a weekday visit to avoid the crowds. We were greeted by lovely staff dressed up in their halloween finest who directed us out to the fields. As you make your way through to the pumpkins you go through the main tent which is home to all the festivities and also as many pre-picked pumpkins you can imagine. Perfect if you don't want to brave the elements or not able to manoeuvre the muddy fields. Still a lovely day out. 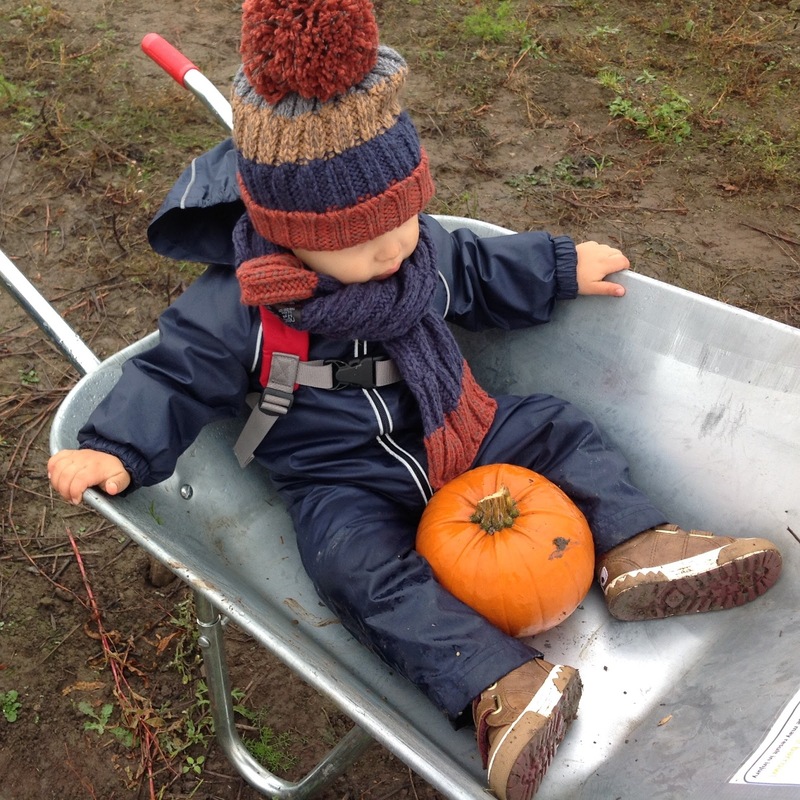 Before you walk out to the fields I also recommend you grab a wheelbarrow, especially if your children are at the age were they can pick a pumpkin up. 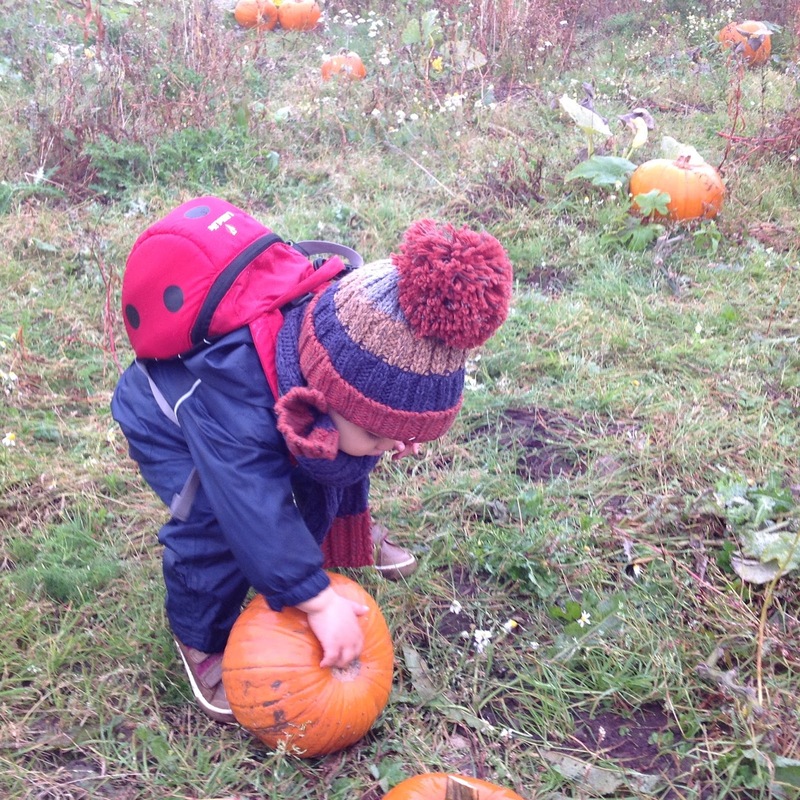 Children can have lots of fun hunting the pumpkins down and filling up the barrow. They can then select which one or ones they want at the end and have as much fun putting the unwanted ones back. 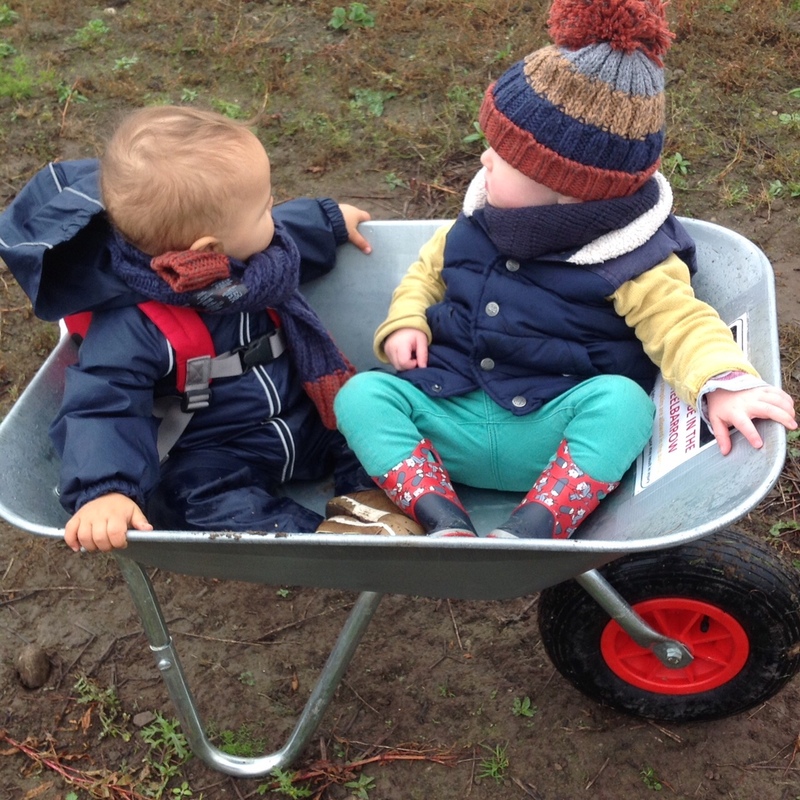 For us we used it to pop the babies in for a photograph, which I have to say is not recommended in the wheelbarrow we used (don't tell anyone). But there are more stable ones you can pop the toddlers in for pics. 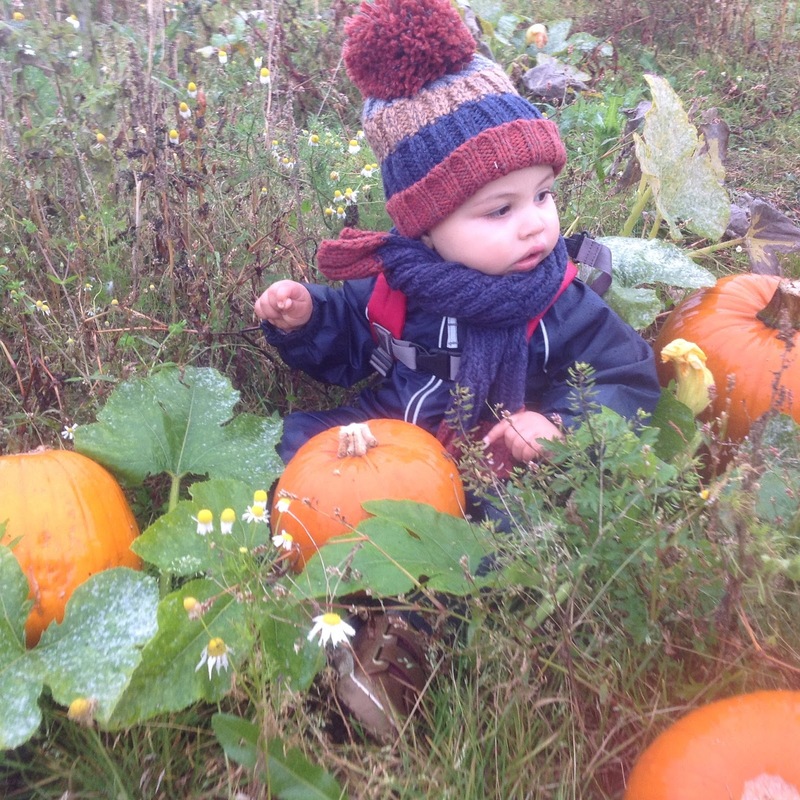 Henry loves trying to pick up the smaller of the pumpkins and he also loved being independent toddling around the mud. He fell a few times, but just picked himself up and got stuck into the fun. We were very lucky as we had the whole field to ourselves for the first 15 minutes, so it was lovely taking it all in. But even when it got busier it was still lovely seeing everyone getting stuck in and all the parents taking their own little picture memories. After the fields we headed back with our pumpkins to the main tent to see what was happening. Unfortunately both Henry and Kasper were too young to try out the other activities, but in fairness they were both starting to flag (us Mummy's too) so we headed out to the front of the farm. The boys enjoyed a race around the hay bales in little tractor cars and also saying hello to the pigs (oink oink). I would have loved to have done some shopping in the Farm Shop but the boys were getting restless so we bundled them into the car. We also had a quick nose into the Cafe, but at 11.30am it was already full. So again I recommend you time your day perfectly as it does fill up quick or take along a lunch to have in the designated picnic areas. I will be taking Henry back in the summer to pick strawberries and hopefully finally get into the shop. 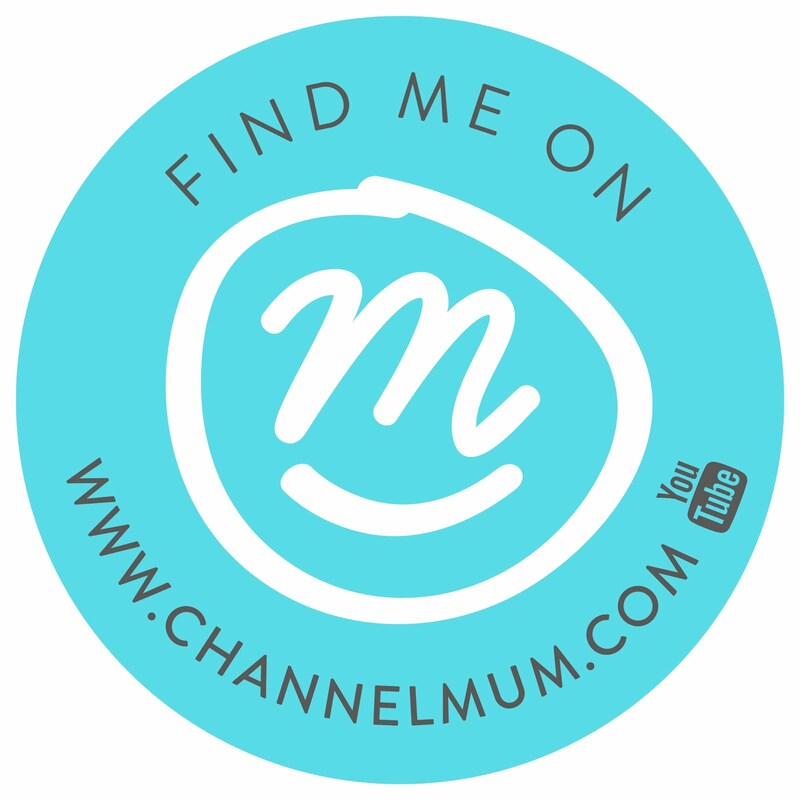 For further information and FAQ - have a nosy right HERE.